Keeper Zachariah Mutai attends in March to Fatu, one of only two female northern white rhinos left in the world, in the pen where she is kept for observation, at the Ol Pejeta Conservancy in Laikipia county in Kenya. Scientists have successfully grown hybrid white rhino embryos in the lab, stoking hopes that a purebred northern white rhino could be implanted in a surrogate. 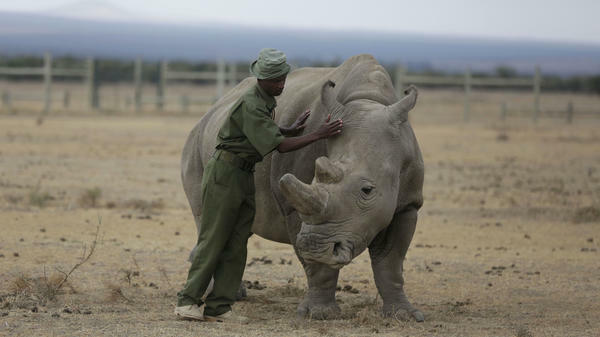 The last male, a rhino named Sudan, died in March. But before the males died off, wildlife experts collected and froze sperm. Now, in the journal Nature Communications, scientists say they successfully have used this stored sperm to fertilize eggs taken from a closely related subspecies, the southern white rhinoceros. The resulting hybrid embryos started to develop in a lab dish. Two were frozen for later implantation into a surrogate rhino, although the researchers note in their paper that "the embryo transfer procedure has yet to be developed and validated in rhinoceroses." Still, the researchers are hopeful that once they get this working with hybrid embryos, they can use the same techniques to produce pure northern white rhino embryos. "Our goal is that we have, in three years, the first northern white rhino calf born," says Thomas Hildebrandt, of the Leibniz Institute for Zoo and Wildlife Research in Berlin. While this kind of assisted reproduction is used for other large mammals, including horses and cows, this is the first time lab-grown rhino embryos have reached the point they could be transferred into a uterus. "That's a big deal. That's a big jump in rhino assisted-reproductive technology," says Terri Roth, director of the Center for Conservation and Research of Endangered Wildlife at the Cincinnati Zoo & Botanical Garden. "In the past, we've really struggled to just produce two-cell embryos. So this is taking it way beyond that." But Roth, who wasn't involved in the study, cautions that going from an embryo in the lab to an actual baby rhino is no small feat. "There are many, many steps from the petri dish to the live calf on the ground," she says. Because of the uncertainties, the scientists are pursuing several different strategies. Besides trying to produce pure northern white rhinos, they also plan to transfer hybrid embryos into surrogates. Hybrids of southern and northern white rhinos could help conservationists, if they ever try to introduce white rhinos back to their northern range. It also could be possible to use generations of inbreeding to dilute out the southern white rhino genes and get to something close to a pure northern white rhino—although that would require a small herd of the hybrids. "Will we ever get back to having a pure northern white rhino again? I think the odds are low," says Roth. "But that doesn't mean those genes aren't important." Besides working with sperm and eggs collected from northern white rhinos, the scientists have a longer-term goal of making sperm and eggs to order in the lab, by manipulating stored skin cells taken from the animals. "That might take maybe a decade," says Hildebrandt. Already though, using some rhino embryos, the team has established that they can make an embryonic stem cell line, a step that's useful in that process. Roth calls that whole plan "highly speculative," and thinks the most important lesson here is that it's a mistake to get to a point where advanced technology is the only remaining option to save a species. The northern white rhino isn't the only rhino that's in trouble, after all: Of the five living rhino species, three are listed as critically endangered because of poaching and habitat loss. Fewer than a hundred Sumatran rhinos, for example, are believed to exist today. "We could still bring them back," says Roth, "but if we lose another 90 of those animals and we're down to 10, then we're going to lose that one too." The most endangered mammal in the world is the northern white rhinoceros. Only two of these rhinos are known to be alive, and they're both female. Scientists have not given up. NPR's Nell Greenfieldboyce reports on a key advance in the fight to save this creature from extinction. NELL GREENFIELDBOYCE, BYLINE: A northern white rhino looks pretty much like a southern white rhino. But they come from different parts of Africa and have a separate genetic heritage. And while there are thousands of southern white rhinos, the only northern white rhinos left are a couple of females named Najin and Fatu. That's it despite a long conservation effort. JAN STEJSKAL: We've been working on saving northern white rhinos more than 40 years. GREENFIELDBOYCE: Jan Stejskal works at a zoo in the Czech Republic, where the last two rhinos were born. He says northern white rhinos don't breed well in captivity, even with artificial insemination. STEJSKAL: We thought, what else could we do to enhance the chances for them to breed? GREENFIELDBOYCE: So the rhinos were sent to a sanctuary in Kenya with the hope that more natural surroundings might encourage them to make babies. No dice. And in March, the last remaining male died. Now, though, there's new hope. In the journal Nature Communications, Stejskal and a team of researchers report they've made rhino embryos in the lab. They did it with frozen sperm from northern white rhinos and eggs from southern white rhinos. The hybrid embryos grew well, and that makes researchers optimistic that they can use the same techniques to produce embryos that are pure northern white rhino. For that, they'll need eggs from those last two females. Stejskal says they're seeking permission to collect them. STEJSKAL: Before the end of the year, for sure. I hope in, let's say, three or four months, we could go to Kenya. But, you know, it's not granted yet. GREENFIELDBOYCE: Both hybrid and pure embryos could be put into surrogate mothers. This kind of thing is common for livestock, but rhinos are a different story. And a rhino pregnancy lasts about a year and a half. Terri Roth is director of the Center for Conservation and Research of Endangered Wildlife at the Cincinnati Zoo and Botanical Garden. TERRI ROTH: There are many, many steps from the petri dish to the live calf on the ground. And so given the advances that this paper has presented, I think there's reason to be hopeful. But we've still got a ways to go. GREENFIELDBOYCE: She worries that the public may hear about all this and believe that science is going to save the northern white rhino when, to her, it seems like a long shot. (SOUNDBITE OF SAM GENDEL'S "PASS IF MUSIC") Transcript provided by NPR, Copyright NPR.